If you suffer from allergies, sinus infections or even a stuffy nose, your doctor may recommend using a neti pot or another means of irrigating your nasal cavity and sinuses. This irrigation can help flush mucus and irritants including dirt, dust and pollen out of your nasal passages. Whether you rinse with a neti pot or nasal irrigation bottle, daily use, at least while having symptoms, may work best for symptom relief. 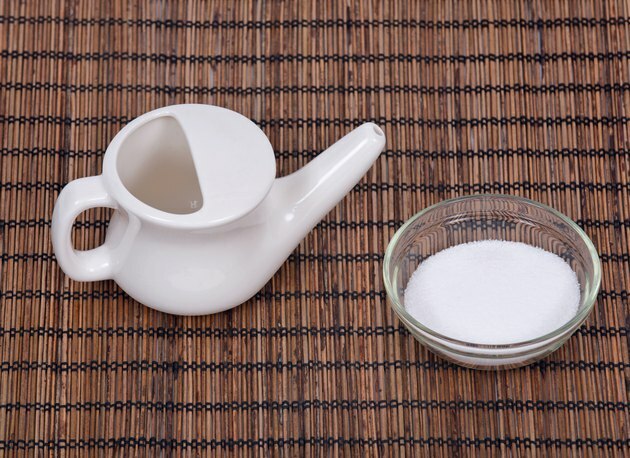 A neti pot is a tool used to flush or irrigate the nasal cavity with a gentle salt, or saline solution. A typical solution recipe is 1 teaspoon non-iodized salt, a pinch of baking soda mixed in 2 cups of water, or the use of a premixed saline packet designed for nasal rinses. Steps include inserting the spout of the pot into one nostril and, while bending over a bowl or sink, pouring warm saline water into your nasal cavity. The goal is to flush your nasal cavity, removing mucus and irritants, which improves sinus symptoms and congestion. When you have nasal or sinus symptoms such as a stuffy or runny nose or congested sinuses, daily irrigation with a neti pot or irrigation bottle can be helpful. According to a November 2009 statement published by “American Family Physician,” daily or even twice daily use is helpful and safe to use when you have symptoms. A 2012 analysis of 10 studies, published in the September-October 2012 issue of “American Journal of Rhinology and Allergy,” also concluded that daily use of nasal saline irrigation (NSI) improved nasal and sinus symptoms -- and was relatively safe, easy, inexpensive with minimal adverse effects. However, the longest study the authors evaluated lasted 12 weeks. While daily nasal irrigation is considered safe, to date published studies are not available to explore any risks or adverse effects of using long-term NSI. A study that has raised some questions was presented in November 2009 at the annual scientific meeting of the American College of Allergy, Asthma and Immunology. This unpublished study tracked 68 adults with recurrent sinus infections over a 2-year period. Twice daily NSI was used the first year to manage symptoms, using neti pots or other devices, and NSI was not used the second year -- during which time repeat sinus infections dropped by 62.5 percent. While more quality research is needed to clarify any long-term adverse effects, it’s probably best to use NSI when you have symptoms, or according to your doctor’s advice. Also, it’s wise to discuss the pros and cons of long-term use with your doctor. While not related to frequent use, there is a plausible explanation why NSI may increase recurrent infections. Contamination of neti pots and other irrigation devices, by the user's own bacteria, can lead to reinfection, according to an article published in the October 2010 issue of “Laryngoscope.” This study noted contamination of nasal irrigation devices, such as neti pots, was found in more than half of the study subjects -- a problem that can be prevented with proper cleaning methods. Always start with a clean neti pot, and after use, clean thoroughly with soap and water. The Food and Drug Administration (FDA) recommends that distilled, sterile or boiled and cooled tap water be used to clean neti pots or any other devices used to provide saline rinses. The pot should be air dried or dried inside with a paper towel. According to the Food and Drug Administration, tap water should not be used in neti pots unless it has been properly filtered, or boiled for 3 to 5 minutes, then cooled. Sterile or distilled water is often recommended. According to the Centers for Disease Control and Prevention, the use of tap water in neti pots could rarely lead to a fatal brain infection, caused by an amoeba in tap water. However, with proper cleaning and the use of sterile water for your neti pot, NSI is considered safe and appropriate for once or twice daily use when you have symptoms. In addition, no published research is available to suggest that long-term, daily neti pot use has ill effects. Minor side effects may include discomfort with the first few uses, but with the proper procedure, including the use of saline water, the irrigation will be more comfortable. If after using the neti pot, your symptoms have not improved, or if they worsen after nasal rinsing, talk to your doctor. If you have a fever, nosebleed or headaches after the use of your neti pot, see your doctor. Laryngoscope: The Clinical Significance of Nasal Irrigation Bottle Contamination. Annals of Asthma, Allergy and Immunology: Abstracts of the 2009 Annual Meeting of the American College of Allergy, Asthma and Immunology. November 5-10, 2009. Miami, Florida, USA.